Spring cleaning: A healthy tradition for body, mind and bankbook. Keeping spring cleaning green is especially important in an apartment where quarters can be close. If you choose environmentally friendly cleaning supplies and take a fresh-air focus, you can avoid respiratory or skin irritation while cleaning, according to House Logic. By dividing up your spring cleaning session into manageable chunks, you can accomplish your cleaning goals in just a day or two. Deep-clean surfaces with a vinegar and water solution. Use baking soda for scrubbing away stubborn grime. Remove mineral and/or rust stains from toilet, tub and shower surfaces with a pumice stone or a baking soda and vinegar scrubbing paste. Clean tiled floors and grout with a wet/dry vacuum to avoid driving dirt into the porous surfaces. Vacuum baseboards, window blinds and beneath furniture. Wash sheets, mattress pads, curtains, blankets and bed skirts. Have your upholstery and carpeting professionally cleaned by a company that uses non-toxic products. Dust/ wash woodwork, window sills, doorframes, ceiling fan blades, television and other electronics. Wash your windows with vinegar and water. 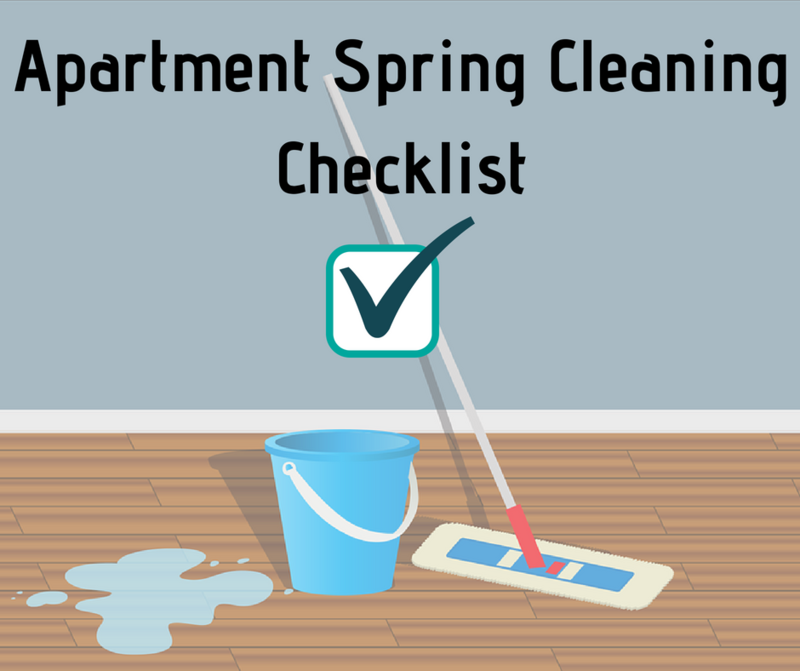 A thorough apartment cleaning each spring provides you with a number of financial, mental and physical health benefits that make your time investment eminently rewarding. Although the most visible benefit is a sparkling clean apartment, you will find yourself enjoying a host of others too. As an apartment dweller, keeping your space fresh and clean means you increase your chances of recouping a significant part of your damage deposit when you are ready to move. By maintaining the appliances, flooring, blinds and fixtures that came with your apartment, you can keep them in good working order and looking their best. That way, you can avoid big deductions for untimely replacement and repairs. From a purely psychological standpoint, you will likely feel more positive in a home that is clean and tidy. Renewing your apartment with a thorough cleaning has a ripple effect on your own mental outlook, raising your spirits and putting you more at ease in your personal space. Physically, a clean, chemical-free environment keeps allergies at bay. A clean kitchen and bathroom reduce your chances of bacterial infections. Even the act of spring cleaning itself gives you a healthy workout and burns unwanted calories. Find out about your apartment options in Buffalo by contacting us at Ellicott Development. We offer a variety of premium residential and commercial spaces plus hotel accommodations in the Buffalo, N.Y. region.